Hummus is one of Andrew’s favorite snacks. In fact, I knew I had raised a foodie one day a few years after he came to live with me. I was in a hurry one morning and had asked him to make his own sandwich. When I came into the kitchen, I found him beaming over his creation. “What kind of sandwich did you make?” I asked him while I was spinning around trying to get ready for work. “It’s a hummus, pine nut, paprika, and gruyere sandwich with a little walnut oil!” he proudly stated. After that he put hummus on everything. Now, five years later, he still likes hummus spread on his sandwich and will reach for it first thing after he walks in the door from school. 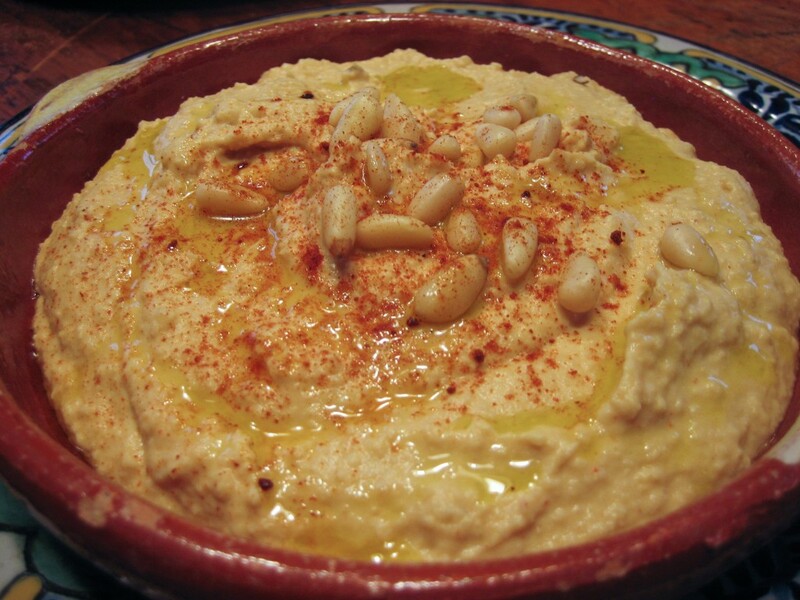 Hummus is one of those things that is so easy to grab at the store that most people will never find out how good homemade hummus can be. As with all legumes, it does take a little forethought, but not that much effort. Andrew prefers the homemade hummus and so will you. Soak the chickpeas 8 hours or overnight, drain. Place all the ingredients in a large stock pot, add enough water to cover the beans; bring to a boil, and then lower heat and simmer for 1-1/2 hours. Remove the beans from the heat and drain into a colander over a bowl to capture all the stock. Put the stock back into the stock pot and set aside. Remove the parsley, bay leaves, and any large pieces of onion from the beans. Fill the bowl with cold water and submerge the beans. Now, with your hands, grab handfuls of beans and rub them between your palms to loosen the outer skins. The skins will fall off and float above the beans making it easy to scoop them out. This is an important step if you want an extra smooth hummus. However, it can be frustrating as no matter how many times you rub the beans, you always find more skins. A good friend told me he did it for an hour one time to make sure he got every skin! My suggestion is that you do it for about five minutes to get the bulk of them and then forget about it. Place the beans back into the stock and simmer until very tender. About a half hour more, but check occasionally. Place the garlic and the beans in the food processor and grind until you get a fairly smooth mixture. Add the rest of the ingredients, except the stock,and blend. Slowly add stock until you get the consistency that you like, but remember that you will want it a little wetter as it will firm up considerably in the fridge. 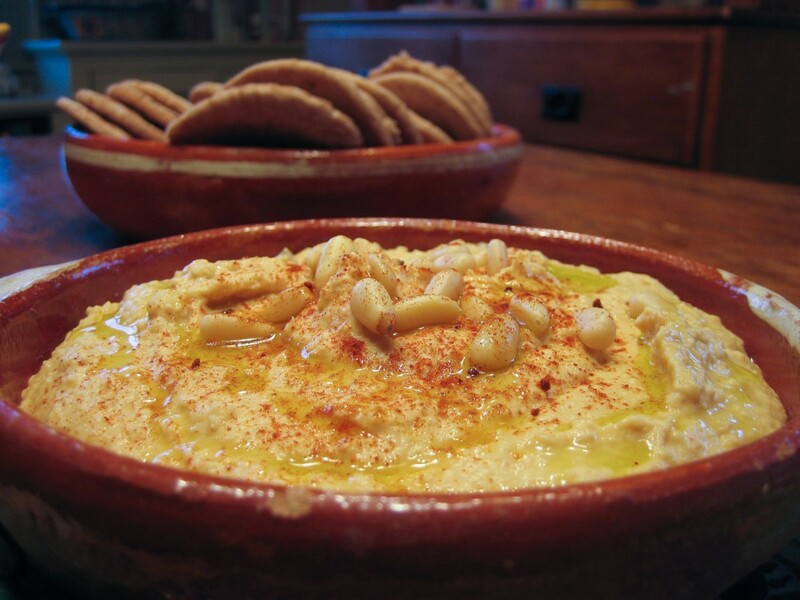 When ready to serve, just drizzle it with a bit of olive oil and garnish with pine nuts. That looks good uncle don!!! A hummus sandwich does sound good. Have you every tried to put rosemary in hummus? Previous post: Pancakes, Hold The Dairy.